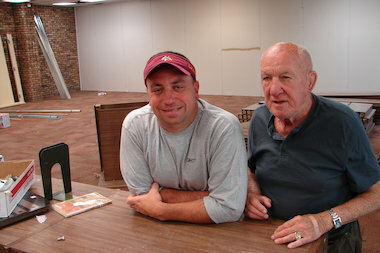 Brother Rice High School's assistant wrestling coach Jan Murzyn (l.) and head coach Bill Weick stand in a wing of the library that is being converted into a wrestling room. Weick is a legendary wrestling coach who's taken U.S. teams to Cuba, Mongolia, Panama, Romania, Canada, Russia and France. MOUNT GREENWOOD — Coach Bill Weick's cauliflower ear and firm handshake serve as an appropriate introduction to a man who's dedicated his life to wrestling. Weick, 82, will further build upon his legacy this summer as Brother Rice High School adds a new wrestling room. The 3,224-square-foot room comes a decade after Brother Rice hired Weick, who spent 18 years coaching at rival Mount Carmel High School in Woodlawn. "I didn't realize when I came here that the facilities were in such shape," Weick said, referencing the 1,350-square-foot wrestling room behind the bleachers that previously served as the Crusaders' wrestling room at the school at 10001 S. Pulaski Road. The long, narrow room was often wickedly hot, which Weick said was a blessing only for wrestlers looking to shed weight. It was perched above school's swimming pool. Legend has it a pair of heavyweights in the 1980s were grappling one day and crashed through the glass window, landing in the water below, Brother Rice assistant coach Jan Murzyn said. The new facility is on the first floor. It replaces a portion of the school library that had been slated for a media room, intended to house television production equipment, Brother Rice Principal James Antos said. When a classroom space opened up for the media room, the wrestling program quickly snatched up the available spot. The new wrestling room will be connected to the weight room via a catwalk and will feature new mats and padded walls. "I think [the administration] realized there was a need for it," Weick said. "Our facilities can now compare with other programs" like rival Marist High School as well as Mount Carmel. The wrestling program at Rice has been on the rise since Weick signed on in 2004. The all-boys Catholic high school has long been heralded for its basketball program, but Weick has groomed 32 qualifiers for the wrestling state tournament since coming to Brother Rice. Last year, the Mount Greenwood high school had its first state champ, Rudy Yates. No doubt Weick's pedigree in the wrestling world had something to do with the school's decision to build the wrestling room. He won the Illinois state title while at Tilden Tech High School in 1949. After high school, he won two NCAA titles competing for the University of Northern Iowa in 1952 and 1955. He competed nationally in Greco-Roman wrestling for several years until turning his attention to coaching. Weick was on the U.S. Olympic team coaching staff in freestyle in 1972, 1980, 1984 and 1988. While reminiscing on some of his career highlights, Weick recalled coaching the Junior World Championship Team on July 20, 1969. The competition was set amid the Cold War, and Weick's squad pulled off an upset victory. "We beat the Russians 51 to 50," he said, noting that the unlikely win went largely unheralded as the competition was held on the same day as the Apollo 11 moon landing. In Chicago, Weick is best known for coaching Mount Carmel. The Caravan wrestling program achieved national acclaim under Weick, winning the state dual meet title three straight years beginning in 1992. He had 22 individual state champions during his tenure. Weick, a resident of suburban Chicago Ridge, believes the Brother Rice wrestling program is on the same path. He likened the program to the career of Kevin Kelly, a 2005 Brother Rice graduate who wrestled at 171 pounds. Kelly, of suburban Oak Lawn, never wrestled until his sophomore year. That same year, he lost every match. By the time he graduated, Kelly was an All-American and went on to wrestle at South Dakota State. He's now a graduate assistant wrestling coach at Dakota Wesleyan University in Mitchell, S.D. "He epitomized everything we are trying to do," Weick said.